Koitalel Arap Samoei (1860 – October 19, 1905) was an Orkoiyot, the supreme chief of the Nandi people of Kenya. He led the Nandi resistance against British colonial rule. Samoei was born to Kimnyole Arap Turukat at Samitu in Aldai. He was the last of four sons and belonged to the Kaplelach age-set. Even though he was the youngest, he was reportedly close to his father and displayed the greatest ability in understanding prophetic signs. Kimnyole, who is said to have predicted his death, reportedly summoned his four sons as he saw his time approach and asked them to consult traditional brews in a pot. Samoei upon gazing into the pot, drew his sword in protest having perceived the coming of the Europeans. Kimnyole sensed danger in his sons bravery and out of concern for his safety, sent Koitalel's three siblings to live among the Kipsigis while Samoei was asked to go and live among the Tugen. After the death of Kimnyole, a faction of Nandi people sent for Koitalel who had already taken refuge among the Keiyo. Koitalel's brother, Kipchomber Arap Koilege, also lay claim to Nandi leadership, leading to a succession dispute. Factions formed around the two aspirants and minor skirmishes took place between their supporters but this did not extend to full scale war. The dispute ended with the defeat of Kipchomber Arap Koilege in 1895, after which he fled to the Kipsigis with his supporters, becoming the first Kipsigis Orgoiyot. Koitalel was appointed successor to his father, and was made Orkoiyot in 1895. When British colonials began building the Uganda Railway through the Nandi area, Koitalel led an eleven-year resistance movement against the railway. To end the resistance, the British Col. Richard Meinertzhagen invited Koitalel to negotiate a truce. The peace meeting was to be held at 11:00AM on October 19, 1905. Suspecting that he would be killed as his father Kimnyole had feared, Samoei instructed the British Colonel to come with five companions to meet him at Ketbarak (present day Nandi Bears Club). Samoei was to come with five foretellers. Contrary to the agreement, Meinhertzhagen marched from the fort at Kaptumo with 80 armed men, 75 of whom hid near the venue of the meeting. It is reported that when Koitalel stretched his hand to shake Meinhertzhagen's, the British Colonel shot him at point blank range thus killing him and effectively ending the Nandi Resistance. He was succeeded by his brother, Kipeles Arap Tamasun, while his son, Barsirian Arap Manyei (born 1882), would later become the Nandi leader from 1919 until 1922 when he was detained by the British. Barsirian was not released until 1964, making him the longest-serving political prisoner in Kenyan history. 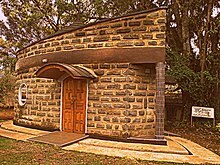 A mausoleum has been built for Koitalel Arap Samoei in Nandi Hills, Kenya. Construction of a Koitalel Arap Samoei University by the local government in collaboration with the University of Nairobi is currently ongoing in Nandi Hills, Kenya. ^ The Standard, October 19, 2013; Too., T., Koitalel Samoei: Nandi legend who fought colonialists. This page was last edited on 16 July 2017, at 12:12 (UTC).